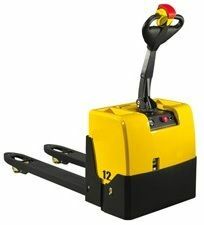 Our Mega-Lift XPm13 1.3 ton mini pallet truck is a pedestrian one that can provide safe and easy horizontal movement for low-intensity work, and it can be used in offices, retail stores, print shops, and so on. Featuring 330kg weight, 1300kg load capacity and compact size, it is an ideal choice for many places. 1. Compact and easy to operation. 6. Emergency reverse device in the handle provides improved operating safety. 7. Emergency power disconnect switch. 8. Braking applied with handle upright and horizontal position, increasing the safety of the truck. Our Mega-Lift XP20 / XP25 / XP30 2-3 ton pallet truck is a compact machine with 2000kg /2500kg / 3000kg loading capacity, and it is able to provide safe and easy horizontal pallet movement. It is an ideal choice for high-intensity work fields where loading/unloading and multi-shift operations are often needed. This truck can work independently or together with the platform, and platforms are better used when long-distance transport is needed. Its ergonomic tiller arm is of the optimum length, which is capable of providing easy control and excellent fork-tip visibility as well as keeping the operator a safe distance from the truck. 1. SWISS BUCHER brand Hydraulic pump. 5. Emergency reversing device in the handle provides improved operating safety. 6. Emergency power disconnect switch. 7. Braking applied with handle upright and horizontal position, increasing the safety of the truck. As a professional import of 2 ton pallet truck from China, S2S Create & Engineering Co., Ltd also provide many other high-quality products for clients worldwide, including, electric stacker, electric reach truck, electric tow tractor, scissor lift, aerial order picker, manual warehouse equipment, customized truck, etc. Most of our products have passed the CE certification and ISO9001:2008, and they have been well received in as many as 40 different countries and regions. OEM and ODM cooperation relationships are welcome. If you need 2 ton / 2.5 ton / 3.0 ton pallet truck, please contact us freely.